Across the UK a host of old cinemas and historic picture houses have been abandoned and closed, waiting in the wings to be knocked down and make way for shiny new developments, their huge screening spaces and grand, ornate interiors no longer fit for purpose. Liverpool lost the Futurist Cinema (1912) in August last year, and in September 2015 the Thirties-built, Andrew Mather-designed, Odeon West End in London was bulldozed and replaced with a 10-storey hotel block. Chester’s Grade II-listed Odeon cinema has a different story to tell. Standing proudly on the corner of Northgate Street and Hunter Street, across from the cathedral in the heart of the city centre, the solid, art-deco, red-brick building has been gutted and remodelled by Bennetts Associates into a lively new cultural centre called Storyhouse. 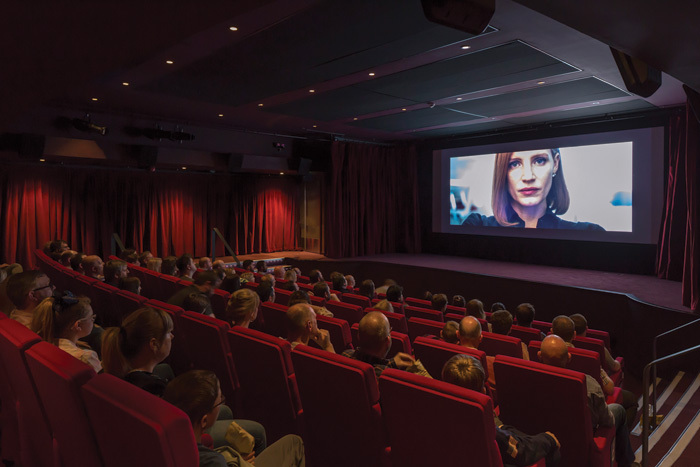 In a similar move to the Mecanoo designed HOME, which merged art-house cinema and independent theatre into a new cultural destination in Manchester (see Blueprint July/August 2015), Storyhouse combines an 800-seat theatre and 150-seat flexible studio theatre for its newly formed repertory company with a small boutique cinema, public library, restaurant and cafe, in an attempt to enliven this ailing north-west corner of the city with culture and activity. It is the first stage in the wider transformation of Chester’s Northgate quarter, centered around a £300m, Acme-designed masterplan that will replace a drab, Eighties’ shopping centre and bus terminal with a new shopping district, restoring the old street pattern and reimagining the old Town Hall Square at its heart. Designed in 1936 by architect Robert Bullivant, the original Odeon cinema seated 1,800 within a luxurious interior crowned by a sweeping, banded ceiling that guided the eye to the ribbed proscenium and screen. In 1976 the cavernous space was split into three screens, with two more shoehorned in in the Nineties. It closed in 2007 and construction on the new £37m scheme started in February 2015. Storyhouse is now a thin, rectangular, 100m-long building that extends along Hunter Street. The old cinema has been stripped back to its shell and opened up to reveal its original form and plasterwork, while an adjacent nine-storey office building at the back of the Odeon has been demolished and replaced by a new brick and cast-glass extension, doubling the size of the building and expanding the floor area to 7,500 sq m. The space where the original cinema screen sat is now the opening between the two buildings, framing a large foyer space and a suspended, bold red staircase that projects out like a piece of theatre scenery and acts as the central focal point and navigation device for the building. Inside, the Odeon’s balcony has been removed and replaced with a mezzanine floor, setting a 100-seat cinema in the middle within a back-lit, cast-glass box with the bar and restaurant below on the ground floor. A children’s library is housed in the old shop fronts looking on to Northgate Street, which originally helped subsidise the cinema. Dark wood library shelves line the walls on all levels of the old building — unlike a traditional library there is no loans desk or librarian telling you to be quiet; everywhere is licensed for alcohol, meaning you can grab a beer and a book and be trusted not to run away with it. It also means that no one section can be closed off from another — if there’s a late-night theatre performance, the library is open too. The whole building is open 12 hours a day, seven days a week. Everything is designed to be as open and accessible as possible, from the big sharing tables in the restaurant, through the retractable screen that can be suspended into the old proscenium arch for free events and silent screenings, to the programme specially curated with local charities and groups to engage marginalised community groups. The new extension houses the main auditorium with a 20m-tall fly tower, conceived, in a reverse of the Odeon building, as a brick box wrapped in an external cast-glass skin. A small, 150-seat studio theatre sits above it, expressed on the exterior as a copper box in an echo of Bennetts’ rusty Corten steel extension to London’s Shaftesbury Theatre (2016). Working with theatre consultancy Charcoalblue, Bennetts has designed the main theatre to seat 800 in a traditional proscenium format for big touring productions, with three tiers, but adaptable to become a more intimate, 500-seat venue with a thrust stage built over the stalls for home-produced work during the quieter summer months. The space is kept simple and functional, exposing the dark-steel frame and using bright-red seats and acoustic panels in stained plywood. As part of its empowerment agenda, tickets are allocated on a ‘first seat, best seat, cheapest seat’ basis — ‘we’re trying to invert the social politics and reward loyalty not wealth,’ says Clifton. 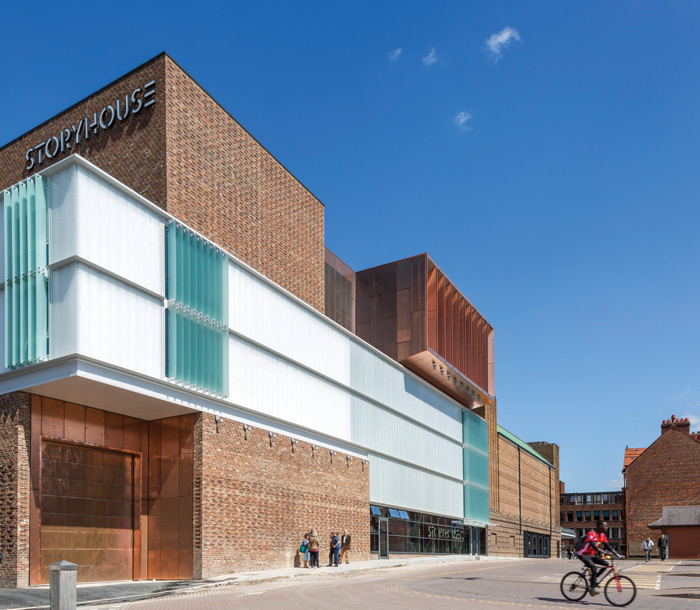 Storyhouse attempts to reinvent the role of a civic building through creative engagement and empowerment. Now people want so much more than a big cinema screen — they need a place to meet and be part of something. Storyhouse’s success will be its community.